So, here we are with the Resurrection reboot. It’s the same story, told from the viewpoint of different survivors, and in it is in full colour and will be a monthly title. So far so good. 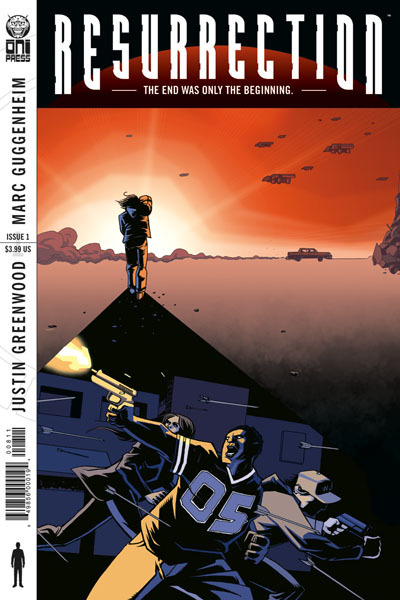 Issue #1 kicks off with an address from Bill Clinton, as the US President, explaining that the Earth is receiving a visitation from Aliens……and then things start to go wrong aboard Air Force One. And to be honest, that is when things start to go wrong with this issue. I just was not engaged at all. The characters left me unmoved, the action was largely uninvolving, though I did like the addition of the ‘Burns’ (humans who were experimented on by the Aliens aka the ‘Bugs’) and the ‘Road Agents’ (human brigands basically, who seem to like attacking with bows and arrows), but the main story left me cold. I didn’t care that one of the central characters died, followed by another shortly after. That was it. There was too much going on, and not enough focus on making characters and situations interesting. The end of issue is a bit ‘who cares?’ for me. Who cares that some guy ends up at a safe zone and one of the armed authority type figures was his wife? So What? That is how it left me. The first volume of this story generally had enough going to keep me involved. I fear that this time round that will not be the case. To summarise, it is a reboot, so if you read it last time around you will get the central theme. The start, starring Bill Clinton, is great. However, the characters lack character and the art is too ‘cartoony’ and the colour adds nothing (in fact, and in retrospect, Volume 1 gained a lot of atmosphere and tone with its all Black and White pages). It just leaves me cold, and I wish it wasn’t so. 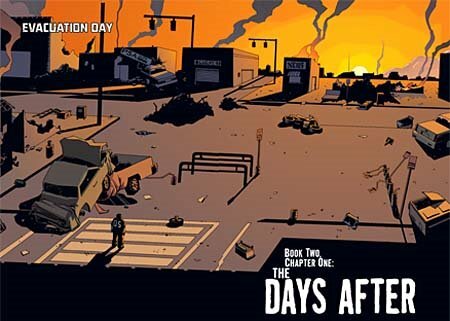 I hope it picks up, maybe I will get used to the art, but in a comic book market where we have some outstanding post apocalyptic tales (The Stand and The Walking Dead do this thing to such a high quality, and even Crossed has its strenghts even if it is an acquired taste), this needs to stand out much more to get noticed.